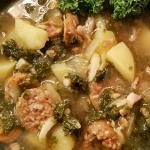 Chorizo Kale Soup Recipe – Argentinian style Chorizo sausage is perfect for soup. Traditionally, it’s a coarse pork sausage that is not as spicy as many other varieties of regional Chorizo sausage recipes. Pin the recipe for later. But… Some are “off the scales” spicy hot like the Logan’s® brand links I find at local Food Lion®. They can also be found in most of our supermarket chains like Wegmans®, Harris Teeter®, Giant® and Safeway®. Which Chorizo Do I Buy? Seasoned with smoked paprika, garlic and herbs, chorizo – in all it’s varieties – is the perfect ingredient to add a layer of flavor to potatoes and kale. 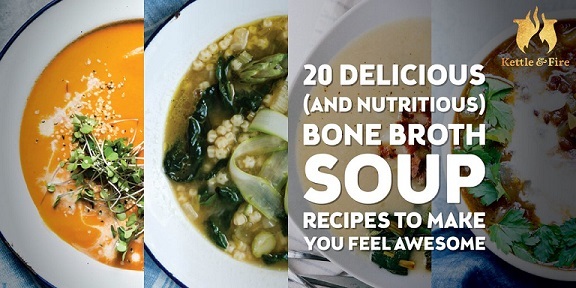 It all depends on how mild you like it or how spicy hot you want to go with the soup recipes. Did you know that Chorizo comes in all these South American varieties? I sure didn’t! I’ve prepared the soup both ways – spicy and mild – and both soups were equally delicious. 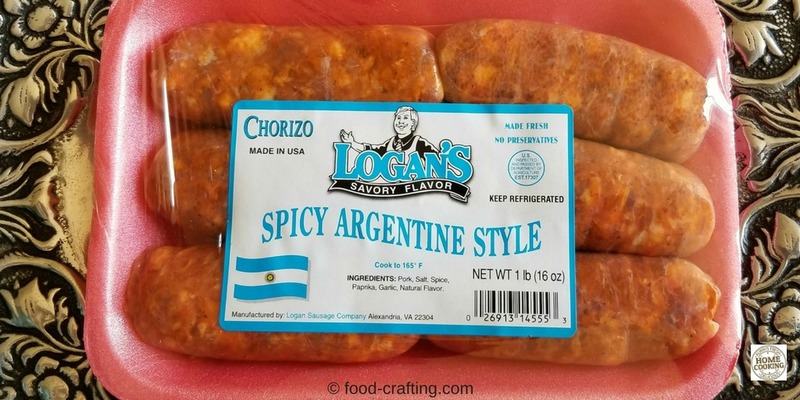 Where Do I Buy Logan’s® Sausage? 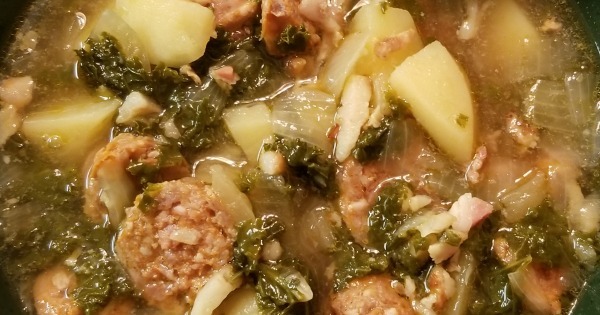 One soup is prepared with mild Argentinian style Chorizo (it has a little bite) and the “variation” was prepared using country style bulk sausage. Check out this recipe prepared with Spanish Chorizo and lots of vegetables! Not only were the soups delicious but they were also incredibly filling. The mild Argentinian Chorizo soup just a little spicier than the seasoned country sausage version. Add a buttered roll right out of the toaster and you can call it a day. Just curl up under a cozy quilt and let it snow. 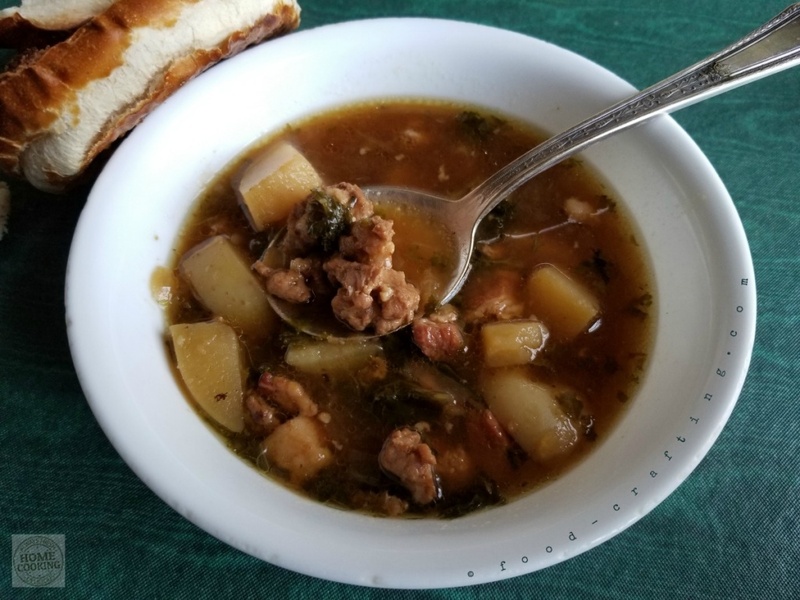 Argentinian Chorizo kale soup with potatoes is a hearty winter soup perfect for blustery days. All you need is a slice or two of crusty bread and a glass of red wine for a complete meal. Blanch the sausages in a pot of simmering water until most of the fat is rendered – about 10 to 15 minutes. Drain, dry on paper towels and slice into 1/4 inch thick slices. In a large Dutch oven, sauté the entire pack of Pancetta over medium heat. After the Pancetta has rendered a little bit of fat, add the diced onions. Sauté until they are translucent and the edges take on a little touch of color. Add the smashed fresh garlic and stir to combine. Do not let the fresh garlic burn. Add all the chicken broth. Stir to combine with onion mixture. Add the Chorizo pieces (evenly sliced of rough chopped). Over low heat, simmer for about 45 minutes to an hour. If you added raw potatoes, you may need that much time to have them fully cooked. When the potatoes are cooked, add the chopped kale and cook through – about 10 minutes. Adjust seasonings if needed and serve piping hot! I did not use salt or pepper to the soup. The sausage is well seasoned but you can adjust the seasonings to suit your taste. I’ll admit to adding a some seasoned salt to the onion mixture but very little of it. I’ve managed to reduce the sodium intake to such an extent that there are times when even I notice. But, in order to taste good, some recipes need a little adjustment where salt is concerned. Try pepper first, then salt. So before adding any salt to the soup, I add up the sodium content of the broth and sausage to determine how much I may want to add. There are times when a pinch more is needed. A 32 oz. carton of Pacific® brand organic free range chicken broth has 570 mg of sodium. They do have a “low sodium” chicken broth with only 70 mg of sodium. You will notice that difference! A 32 oz. carton of Swanson® chicken broth has 860 mg of sodium. They have 33% less sodium at 570 mg of sodium. Compare Swanson’s® to Kitchen Basics® No-Salt at 140 mg of sodium. I prefer using the thick garlic paste in soups and, for this soup, I added it along with the broth. Stir to combine well. As I wrote this recipe post I quickly realized that I never stopped to take photos during the soup making process. So… I decided to prepare another batch of Chorizo kale soup recipe to add to Mom’s weekly menu. If your kitchen gadgets do not include a large capacity ladle (perfect for soups with lots of veggies and sausage), then be sure to have a sturdy 4 oz. ladle (with a 1/2 cup capacity). An extra long handle to reach into deep pans and stays cool is also a great feature. Two scoops and you’ve filled the soup bowl! This recipe can easily be prepared in the slow cooker. How To Make In The Slow Cooker: Prepare the sausage as directed above. Brown the Pancetta, onions and garlic in a heavy skillet then transfer cut sausage, sautéed vegetables and Pancetta to the slow cooker. Set to LOW for 4 hours. Serve topped with shredded aged Parmesan or with slices of baguette. Brown ground Chorizo sausage before adding to slow cooker recipe. Circumstances did not allow me to prepare the second batch of soup in my crock pot. Due to an emergency, we had to travel to Mom’s house on very short notice and I barely had time to gather the soup ingredients. 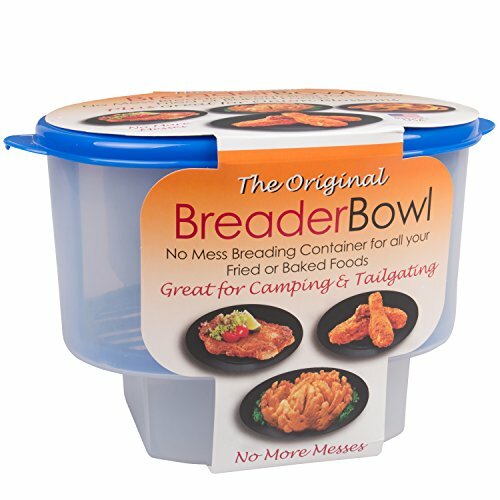 A crock pot? Ha! It never crossed my mind at that early hour on a Sunday morning so when it came time to prepare dinner, I grabbed Mom’s favorite Hammercraft Club Aluminium oval roaster – a true vintage piece of cookware that dates back to the mid 50’s. This pan has graced the stove top in many kitchens over the years. $17.99 a pound will buy you the freshest Pancetta! So, let’s make a sausage and curly kale soup variation in a roaster/dutch oven. 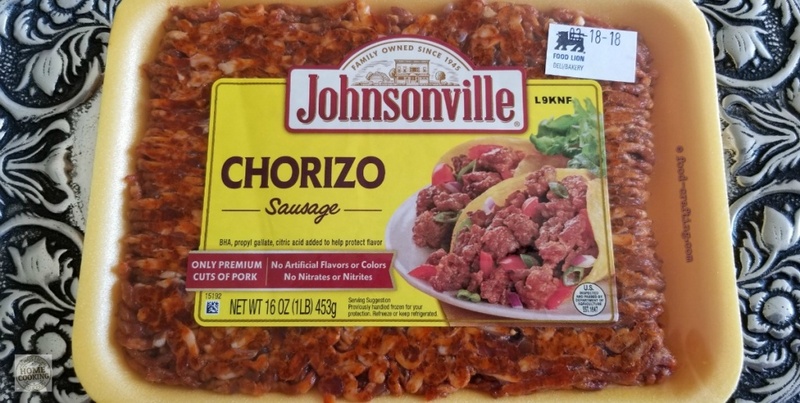 Instead of spicy or even mild Chorizo, I use a pound of the freshest bulk seasoned country sausage mix. It was fresh, very lean and coarsely ground. Even with an equally lean diced fresh Pancetta, there was virtually no rendered fat. The Pancetta and onions cooked for a while before adding the fresh country sausage mix to the pan. 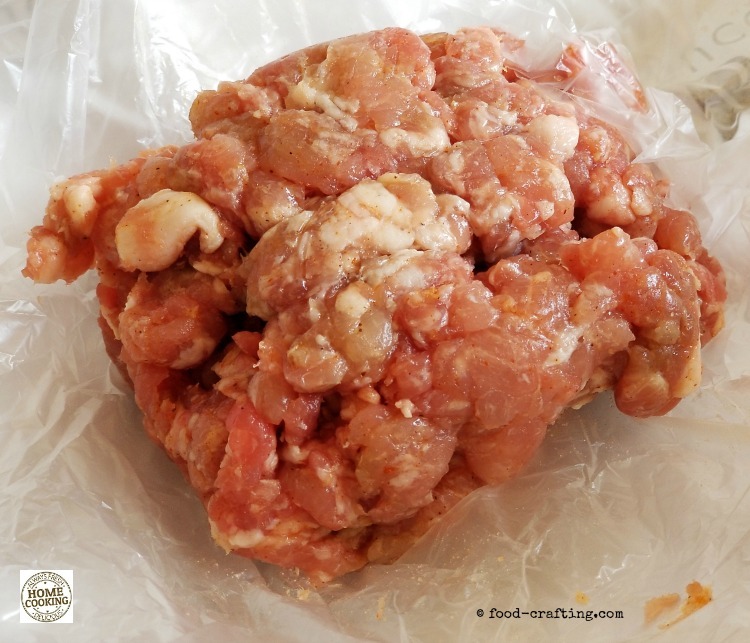 As lean as the country sausage mix was, it also rendered little fat. Instead of rough chopped onions, I diced them a little more evenly and in smaller pieces. The onions were allowed to take on some good color to add a layer of flavor to the country sausage. I added more garlic paste and used two full cartons of Pacific® organic chicken broth. Then I added peeled potato pieces and simmered over low heat, covered, for about 45 minutes. When the potatoes are tender, add 2 to 3 cups of curly kale. Stir to distribute and simmer for another 15 minutes. Adjust seasonings by having Mom taste the soup to see if it meets with her standards. Kale Soup Is Ready – A Table! 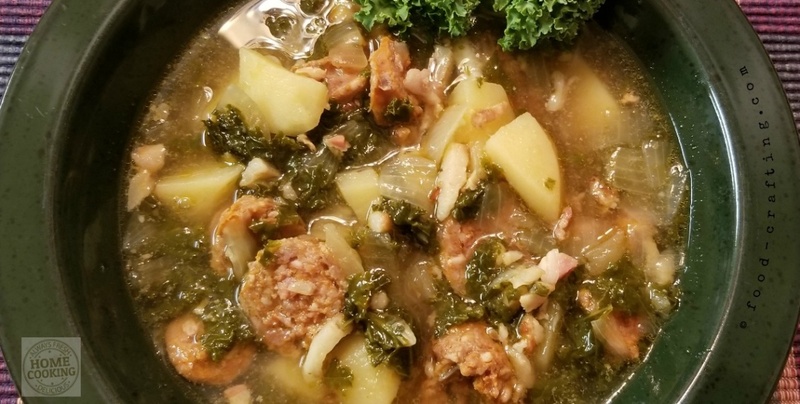 What do you serve with a soup full of country sausage pieces, potatoes and greens? Maybe a grilled cheese sandwich or a toasted pretzel roll. You know that oval Dutch oven full of soup? Three of us ate soup for dinner, two had seconds, and I was able to add two soup dinners to Mom’s weekly menus. 1 Which Chorizo Do I Buy? 1.1 Where Do I Buy Logan’s® Sausage? 6 Kale Soup Is Ready – A Table! 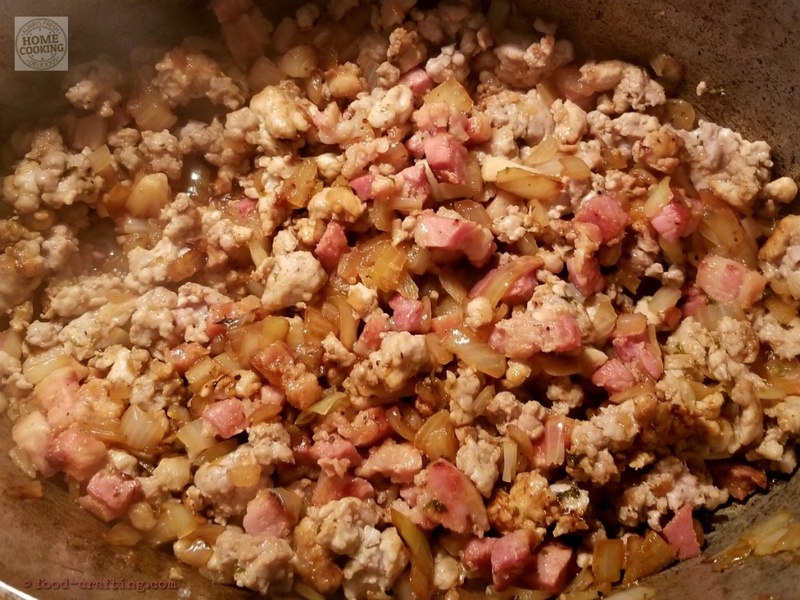 Previous Post Easy Skillet Chicken Recipe: Best You’ll Ever Eat! Next Post Homestyle Soup Recipes: Top Comfort Food Category!